James Key is to join McLaren as technical director in the latest move of a reorganisation aimed at returning the team to competitiveness. 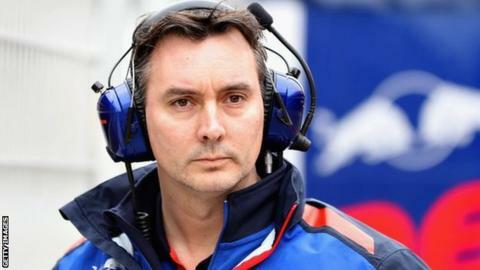 The 46-year old is leaving the same position at Toro Rosso, and will move to McLaren once a period of 'gardening leave' has ended. It is not clear at this stage when Key will start his new role. In a separate development, Matt Morris has resigned as engineering director at McLaren. Morris was one element of the three-man technical leadership team set up by former racing director Eric Boullier which has been disbanded as a result of the team's poor performance this season. Chief technical officer Tim Goss left his role in April. Morris has now followed him out of the team. Only head of aerodynamics Peter Prodromou remains in his position, and is expected to stay on. Boullier left McLaren this month and his position was made defunct and replaced by a new structure. Andrea Stella, who joined McLaren for 2015 from Ferrari along with two-time world champion Fernando Alonso, was named performance director and former Indycar champion Gil de Ferran sporting director. Why a new technical director? Key's appointment was confirmed by McLaren hours after BBC Sport had revealed the news. The establishment of a technical director, a role that has not existed at McLaren for some years, is a further acknowledgement by the team that their previous structure was not working. McLaren split with engine partner Honda at the end of last year and switched to paying for engines from Renault this year. The move came at a net cost of close to $100m but McLaren said it would be worth it because they felt the Honda engine was holding them back. They believed they had one of the best chassis in F1 last year and said their ambition was to compete with Red Bull, who also use Renault engines, for regular podium positions this year. Instead, McLaren have found themselves consistently more than a second a lap slower than Red Bull, and the slowest of the three teams using Renault engines. Meanwhile, Toro Rosso, who switched from Renault to Honda, have remained in a similar competitive position this year to 2017, and Red Bull will drop Renault and switch to Honda in 2019, believing the Japanese company is a better long-term bet. When will Key join McLaren? Key has resigned from his position at Toro Rosso but his start date in his new job is likely to be the subject of negotiation between Red Bull and McLaren. All leading technical figures have to spend time away from the sport when moving from one team to another but the longest this period tends to be is a year. That time could be reduced if the two parties can come to an arrangement - for example with other matters involved as a quid pro quo. McLaren last month rejected an approach from Red Bull motorsport director Helmut Marko for reserve driver Lando Norris. Marko wanted the 18-year-old, who is racing in Formula Two this year, as a replacement for Brendon Hartley at Toro Rosso for the rest of this season. Norris could become involved in negotiations over Key, as could Alonso's team-mate Stoffel Vandoorne, whose future at McLaren beyond this year is in doubt. Key, who has worked for Jordan, its successor Force India and Sauber, is regarded as one of the leading members of a new generation of F1 technical leaders. He was close to joining Williams a year ago but extended his contract with Red Bull to stay at Toro Rosso.